There’s nothing like relaxing outside on a warm, sunny day. The problem is, sometimes the sun makes things a bit too warm, or it starts to rain, and when that happens, you’re forced to go back inside. Not only is that a lot less fun, but you end up losing money running fans or the air conditioner. 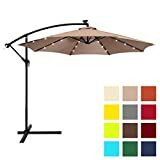 You can avoid that by investing in a patio umbrella, which will not only complement the other outdoor furniture that you have, but also will keep things cool enough that you’ll be able to relax outside all summer long. 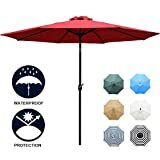 Here are some things to look for when choosing an umbrella for your patio or porch. “Traditional” umbrellas: These are the umbrellas that you’ve seen on patios before. 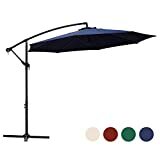 They fit onto a base, with a pole that slides through a hole in a patio table; both the base and the table give the umbrella stability. Offset umbrellas: Offset umbrellas give you a bit more flexibility. The base is set off to one side, so you don’t have to set it up with a table; you can move it around wherever you would like. Lighted umbrellas: This is a great, “why didn’t they think of this sooner?” innovation. One of the purposes of a patio umbrella is to block out the sun. That makes things cooler, but it can also make things darker as well. 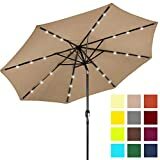 Some newer umbrellas come with LED or other lights on the inside to help correct this. 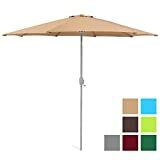 Tilting umbrellas: The traditional umbrella is just a vertical pole with an umbrella on top; tilting models come with one or more hinges that allow users to adjust the umbrella’s angle depending on the time of day. 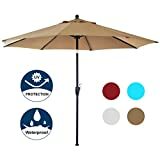 Quality materials: Both the base and the umbrella itself need to be able to stand up to sun, rain, and other elements—otherwise, there’s not much reason to buy an umbrella in the first place. The best models are ones that will take what nature dishes out and do so for years. Wind resistance: An umbrella should stand up to all of the elements, but wind is of a special concern. The best umbrellas can withstand even strong winds without breaking. Cranks and other equipment: Even stationary umbrellas are designed to be adjustable, even if the adjustment is only opening and closing. Good models come with equipment like hand cranks or hinges that are both durable and easy to operate. 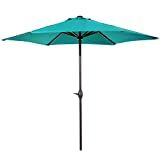 Color and style: Don’t think of your patio umbrella as just something to keep the sun and rain off of you. Think of it as part of your outside décor, and make sure to pick one that will compliment your other furniture. 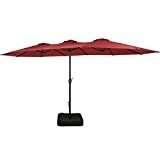 Size: Patio umbrellas come in a variety of sizes, so be sure to pick one that matches your space. If you’ve got a big patio or outdoor table, then go with a larger model that will allow you to use the entire space for relaxing or entertaining. If you have a smaller space, then there’s no point in buying an umbrella that is bigger than what you need. 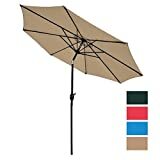 Weight: Be sure to check out the dimensions, including weight, of any umbrella you’re thinking about buying. 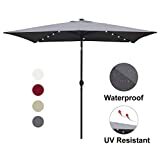 A heavier umbrella might be sturdier, but it might also give you problems when it comes to setting it up and moving it around the patio or yard. Fit with table: If you go with one of the more traditional models, make sure to check the dimensions of the pole to ensure that it will fit through the hole on your patio table. Base: Some models come with a base included, while some just come with a pole. It’s not a major problem to find an umbrella base—there are plenty of aftermarket options out there—but you’ll still want to check and see if you need to buy one before the umbrella arrives; that way you’ll have what you need to set it up as quickly as possible. 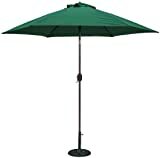 Tropishade: As the company’s name suggests, Tropishade is a manufacturer of patio umbrellas and related equipment. 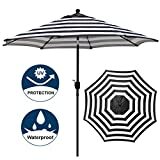 They make umbrellas in a variety of styles, as well as the accessories that go along with them. 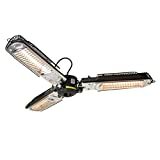 Petra: Petra Imports is a retailer that offers a variety of products for homes and gardens, both on their own website and through other online retailers. Jordan: Jordan is an American manufacturer of home and garden furniture that has been producing high-quality products for over thirty years. Gale Pacific: Gale Pacific is a New Zealand-based company that manufactures fabrics, glass, and the products that use them, for both inside and outside the home. 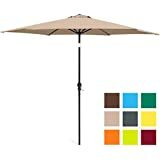 California Umbrella: California Umbrella produces high-quality patio umbrellas in a variety of styles, colors, and types.